Detecting counterfeit currency, Australian notes with transparent stripes. Detecting couterfeit currency, Australian notes with transparent stripes. There are many countries in the world using polymer currency notes. Australia, Canada, the EU, UK are among them. The newest notes are made of polymer with a transparent stripe in their middles. Australian notes have attained in Asia the reputation of being counterfeit resistant. 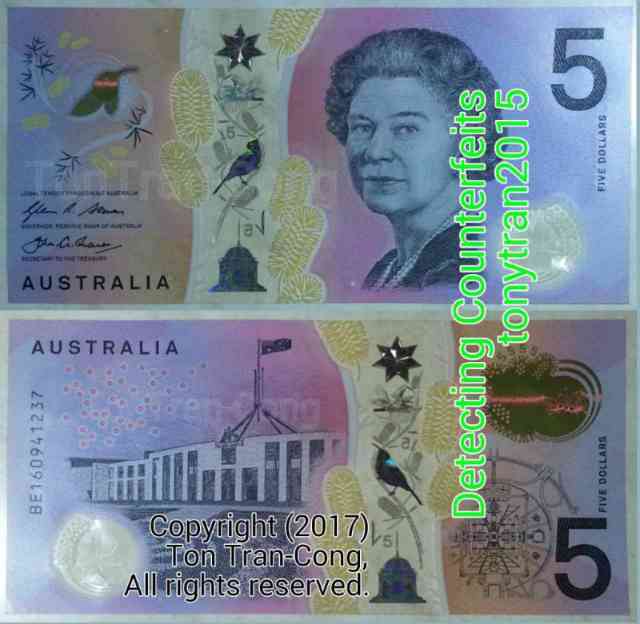 This posting shows the most effective ways to distinguish between real and counterfeit 2nd series Australian polymer notes having transparent stripes. You need no tool for most of these tests but you may need to carry a genuine $5AUS note with you all the time as your sample. The tools for some of the tests are a high power (x10) magnifying glass and a UV LED torch. 1. The transparent middle with metalic hographic features. Figure 1:An Australian note with a transparent stripe. Figure 2: An Australian note with transparent stripe placed against a white background. Since Australia has licensed its previous technology, its older manufacturing technique has been accessed by the organized counterfeiters and many counterfeit polymer $50AUD have appeared, creating hard problems for Australian traders. This occured after the counterfeiters had spent years experimenting with Vietnamese polymer notes using licensed Aistralian technology. A 2nd series of polymer dollars is now issued. The new series is intended to be ahead of the technology of counterfeiters. The technology in the new series is also used in UK, EU and Canadian notes. Anti-couterfeit features of the new notes rely mostly on the technology of holography and microprinting on polymers. These features are carried moatly by the transparent stripes of the notes. The 7 branched Australian Federation Star on the top of the transparent strip appears like a raised solid star: 1. Only the rim of that 7 corner star stays on the transparent sheet as a solid silvery metal line. 2. The the center of this holographic star appears to float about 3mm above the base. The bird next to the Federation Star appears to flap its wings when the angle of view changes slowly. Figure: The gold coloured stamp on the top right of the backside of an Australian note with transparent stripe. The gold coloured stamp on the top right of the backside has an irridescent line moving up and down as if it was 3mm below the stamp, Looking at the bird shaped clear window on the other side of the stamp, the irridescent line appears as of it was 3mm above the bird. 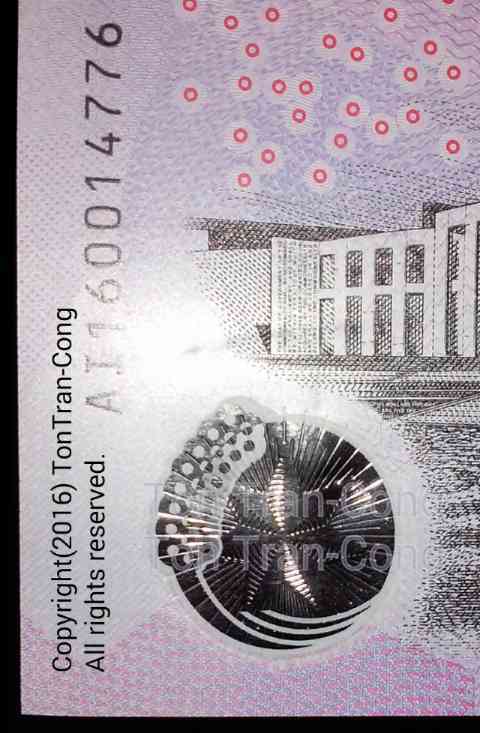 Figure: The welded raised printed transparent plastic window of an Australian note with transparent stripe. The raised transparent plastic window welded onto the bottom left of the back side has fine raised prints of the Australian Federation Star. The clear window cannot be detached from the note (The test is by scratching the edge of the clear windows with your fingernails). The white colour on the rim have been fused into the polymer and can only be scratched off but cannot be rubbed off (The test for non-fused colours is by scratching the colours on the clear windows with your fingernails.) ===> These are effective features against counterfeits. ===> Counterfeiters are currently making only stuck on windows but they have produced clear windows with metal strips to make counterfeit $100 Canadian notes. (see .). 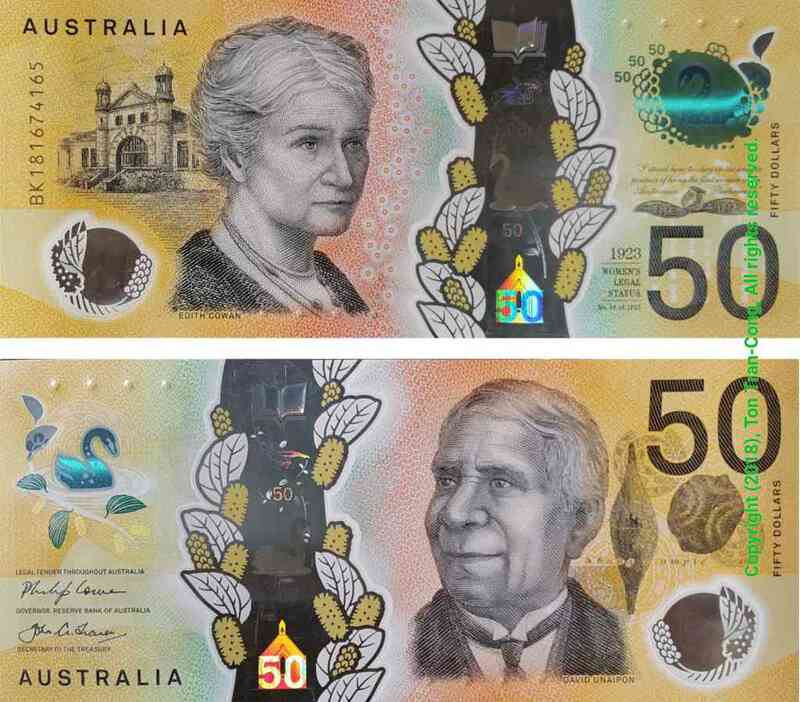 Figure: Fluorescent figures and fine prints on the 5 AUD note with transparent stripe. When placed under short wavelength UV light, the note has the following fluorescent figures. There are fluorescent figures of a green bird and a red tree on the bottom left of the front side. Only the bird has appeared in the above picture as the UV light used for taking that photo did not have short enough wavelength to show the red tree branch. There are also figures of green year number in the center and green serial number on the left rim of the back side. Counterfeiters have now used UV fluorescent ink . Figure: Australian note with transparent stripe has fine printings on the steps of drawing of Parliament House. The characters are 0.3mm in height and are seen through a 30X magnification glass. Figure: A quality 10X magnifying glass for seeing fine features on currency notes. There are fine printings on the 2nd series Australian polymer notes which compare well with the fine printing on the US cloth based notes. The characters of 0.3mm height in size are on the back side of the 5 AUD note, along the steps of the Parliament House. ===> You need to be familiar with these printings to check their quality. 1. 10X magnifying glass. 2. You need to carry a $5 AUS note with you all the time to make non-arguable judgment on the print quality of notes. The five features in the above order are in order of increasing difficulty. They are thus in the right order for an effective detection strategy. From my searches using the Internet, I have not found any case of counterfeit AUS dollars passing more than four of tests at such levels. 1. There are also UV torches sold to detect counterfeit currencies from most countries but high quality UV lights are required for this anti-counterfeit feature on many new notes. A high quality UV light source has UV of short wavelength and narrow spectrum with little visible light emitted. It is neither small nor cheap. 2. Iodine pens give yellow ink mark which darkens to brown on contact with starch from ordinary paper. These pens are sold to detect fake US dollars and will not work on polymer notes. Counterfeiters have had decades of practice in counterfeiting Vietnamese polymer currency [3,4] (printed under technology licensed by Note Printing Australia), They have been operating with little risk of apprehension across the borders there and they are so confident that they openly advertised their counterfeits to ignorant greedy people at 30% of the values of genuine money. They have now targeted the Australian polymer dollars. This is not a surprise as Australia is the first country to issue polymer currency (since 1988) but its currency notes are now lacking modern effective anti-counterfeit features such as holograms and tiny hidden printing. Five dollars notes are being replaced by these new ones with more modern design and gradually larger denomination notes will follow. 7. No more hidden image. There have been reports of counterfeits of Vietnamese polymer currency (made under license from Australia Note Printing) with crude hidden images . The polymer for the 1st.series of Australian notes is soft, uncreasable but tough and is hard to tear at the edge. Counterfeit Australian dollars and counterfeit Vietnamese currency notes appearing in Vietnam are mostly made from non-tough materials . Recovery and toughness tests are carried out by scrunching and by stretching the edge with your fingers . The note will spring back and will not be torn. ===>This test is good for 1st series Australian $50 notes, the genuine note will be replaced free of charge with a new one at any Australian bank if it is not that tough. Many counterfeit $50 notes have been detected by this test in the State of Queensland. However the transparent stripe section and the hologram prints of the 2nd series are not that tough and that uncrunchable. The creasing test should not be applied to the new 2nd series notes. Figure: Front side of new ten dollars note with a transparent stripe. Figures: Fifty dollars note with transparent stripe. Only bottom holograms are spot lighted in these figures. 9. Reducing your exposure to counterfeir currency when TRAVELING. 9.1. Do NOT EXPECT that you may get any CHANGE in countries like Vietnam, let alone receiving changes in genuine notes ! They always think that you will spend like drunken sailors, have the duty to give them the changes as tips and never need to get back any change ! Hide all you money (even from your guides and local acquaintances) and only let them know that little part you have planned for dealing with them. This prevents any robbery being planned on you. Indeed, your local acquaintances may plan a robbery on you when you make a farewell party to them (I know this first hand) ! 9.2. When traveling outside Australia, do NOT show or give a retailer any high value note unless they are READY to give you your changes in GENUINE NOTES. This prevents them from grabbing your note then refuse to give you the change. Do NOT let them pass your note around to ask for changes: The note may come back to you but substituted by a fake one along the way. 9.3. Carry a variety of high value notes so that you can always combine them to pay each of the purchase charges without receiving any change in high value notes. 9.4 Count all your changes before going for the next purchase. 9..5. Only receive high value currency notes from registered banks (They are obliged to check currency notes when receiving and give you genuine usable notes). 9.6. Ask the banks to give you the combinations suitable for your trip until your next bank visit. 9.7. When traveling outside Australia build up and keep a stack (about 50) of small value notes to save yourself from asking for changes from sellers. They will pretend not having any and asking you for tips ! Hide it from retailers as they will try to get it off you by any mean to corner you into not receiving changes!. There are raised marks on the new 5 AUD note to tell its value using only touches. 11. Unused very effective available 1st line of defence: Holograms. Figure 1: Looking at a LED torch through the anti-counterfeit hologram window of a Vietnamese polymer note reveals a hard to counterfeit pattern. es from left to right. Note Printing Australia, a wholly owned subsidiary of the Reserve Bank of Australia has provided Vietnamese money Printer with a hologram technology for anti-counterfeiting. The technology has been applied to the Vietnamese currency worth more than $2US. This hologram method currently appears to be the MOST EFFECTIVE first defense line against counterfeit notes. The new 100 US dollar notes have a blue hologram bands with tiny pictures of the number 100 in checker pattern. When the viewed at varying angle from left to right these patterns smoothly move downward as if they float on the notes. Canadian 20 dollar notes have both see through and metallic holograms. Hologram technology should be added to Australian notes. .Figure : Small print is hidden inside the base material of a US currency note made of cloth material. Small print buried inside the base material now replaces the old metallic wire buried inside the base material. It is seen when the note is hold up against a strong background light. The technology has been applied to Vietnamese notes, it would be an effective addition to Australian notes. ===> Counterfeiters have produced hidden figures but they are too crude for security small prints. 13. Unused very effective available 3rd line of defence: Iridescent ink for features. Figure: The gold coloured ink for the emblem of a coiled reptile (?) on a Vietnamese note is claimed to change to a grey metallic colour (left part of the composite photo) when viewed from a glancing angle under daylight. The technology has been shown applicable to polymer notes. On a cloth based $100 US note, the picture of a bell in a bottle can be made to clearly change from bronze to green by shining a strong light beam at normal and at glancing angle. The test is easy when you have a LED torch to shine a strong light beam onto the ink and change the beam angle from normal to glancing. The technology has been applied to Vietnamese polymer notes with less effectiveness. The gold coloured ink for the emblem of a coiled reptile (?) on a Vietnamese note is claimed by Vietnamese State Bank to change to a grey metallic colour when viewed from a glancing angle under daylight. Although this anti-counterfeit feature does not seem to work well on Vietnamese polymer notes but could be made better if adopted on Australian notes. 14. Unused very effective available 4th line of defence: Magnetic ink. Figure 1: The ink on any genuine US note is magnetic and is clearly seen attracted by a fridge magnet. When holding the rectangular note vertically by grabbing its upper short side, you can easily see that the ink on the US dollar notes is attracted by a fridge magnet hold in the other hand. Tool: You need a ceramic fridge magnet for this test. 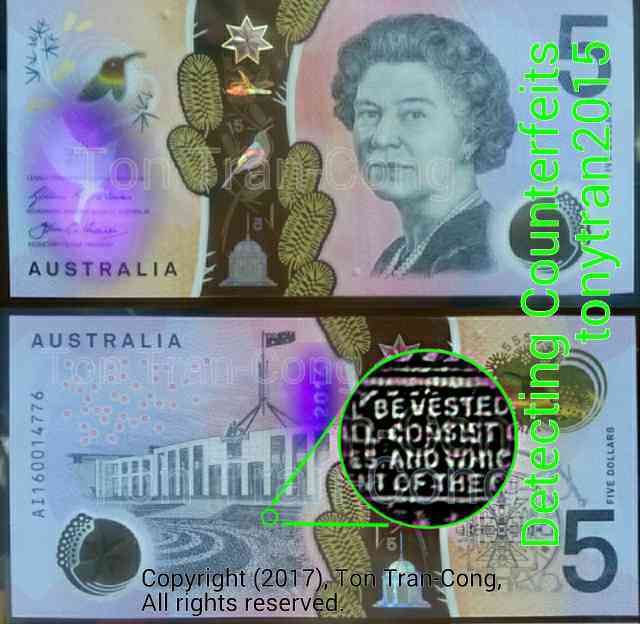 It is desirable to have this technology added to polymer notes.
. Chris Vedelago, Cameron Houston, Australia flooded with fake $50 notes so good they fool banks, The Courier, http://www.thecourier.com.au/story/3757999/austral&#8230;, posted 28 Feb 2016.
. Counterfeit Detection Guide, Could you spot a counterfeit banknote?, Reserve Bank of Australia, http://banknotes.rba.gov.au/counterfeit-detection&#8230;, accessed 20 July, 2016.
. Security Features, Bank of Canada, http://www.bankofcanada.ca/banknotes/bank-note-ser&#8230;, accessed 20 July 2016.
. tonytran2015, Detecting Counterfeit Currency, US dollars, survivaltricks.wordpress.com, https://survivaltricks.wordpress.com/2016/07/15/detecting-counterfeit-currency-us-dollars/ … posted on Jul 15, 2016. ← Comments on Slide Sky Map for displaying tropical stars.